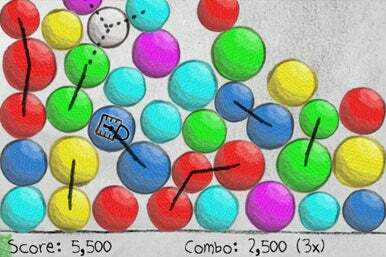 Crayon Ball—a $3 iPhone game from Howling Moon Software—looks great, and it’s a snap to learn. While it’s fun to play, it’s also a bit repetitive. I might open the game up if I’m waiting on a Disney World-esque line, but only after I’ve played some more engaging time-wasters first. Connect Four: To succeed at Crayon Ball, you must get at least four balls of the same color to touch. The first thing you’ll notice is Crayon Ball’s unique visual aesthetic. The art appears entirely hand-drawn, and you can even select from several different themes, like crayon, pencil, or Van Gogh. The game looks cute, and it sounds cute, too. When you start to play, the screen is filled with colored balls. You must get at least four balls of the same color to touch to make them disappear. And when they do, another outpouring of balls will fall in to take their place. To group like-colored balls, you have two options: You can turn your iPhone or iPod touch from side to side to let the accelerometer do its thing, or you can tap on individual balls to make them disappear. Since all the balls respect gravity, they’ll fall down and rearrange themselves as you zap some away. Each time you tap a ball to make it disappear, though, your “Damage Bar” will increase. Making matches brings it down again. But tap too many times, and your Damage Bar will fill up—and the game will end. Crayon Ball is fun, to a point. Ultimately—and unfortunately—the game is very repetitive and doesn’t offer up new challenges as you play. It holds my interest for a game at a time on occasion, but not much more than that. Crayon Ball is compatible with any iPhone or iPod touch running the iPhone 2.x software update.